All facets of language learning are important, including: reading, listening, speaking, grammar, pronunciation, etc. But vocabulary is the most important. Perfect grammar can't help you understand or speak if you don't know the words. On the other hand, if you get the grammar wrong but use the right words, you will probably still be understood. Vocabulary is also the biggest challenge. There are only so many grammar rules. You will be reviewing those same rules over and over again, slowly strengthening your understanding of them the entire time you are learning a language. But the amount of vocabulary in a language is essentially infinite -- new words are coined every year. Read more for advice on how to surmount this challenge! It is often quoted that the 2,000 most common words in the English language make up 96% of the vocabulary in the average spoken conversation (Schonell, et al. 1956; via the Wikipedia). But this is extremely deceptive. All the meaning is in that last 4%. If you take a look at these lists of common words, you'll see they're largely grammar or "connector" words like: a, the, in, on, at, with, who, what, where, etc. Later in the list you'll start to hit basic vocabulary like the colors, "boy", "girl", etc. But you can't have a real conversation with only the 2,000 most common words because in a real conversation you're talking about something! And the topic you're talking about (ex. the weather, music, food, your job, etc) probably has a couple hundreds words specific to it. In any conversation, maybe only a dozen of these specialized words will appear but the other person could say any of them! So, you'll need to know them all. The 2,000 most common words can be a good starting point, but in order to understand or speak about all the same topics that you do in your native language, you will need to know a lot more words! There is no magic number for how much vocabulary you need. You have to simply learn as much as possible. Here is a great article which addresses all sides of this. The article states that Webster's 3rd edition has around 54,000 words and the average native speaker of English knows around 20,000 words. It also lists several studies that show you need to know at least 95% of the words in a written text to understand it. When I started reading Harry Potter in Polish, I had to learn thousands of new words before I could read comfortably. Almost all of those words came in handy later when speaking with Polish people. There are lots of ways to learn vocabulary: flashcards, word lists, computer programs (ex. Rosetta Stone). 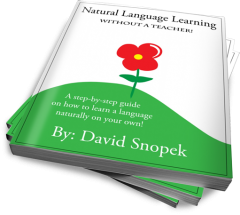 But in your native language, you learned almost all the vocabulary you know from context. That is from encountering the words while reading or listening to others. Why should we learn differently when studying a foreign language? You'll need to learn the grammar, but only to get an understanding of how things work. You cannot quickly learn the language from grammar alone. - From evan1965, creator of CURSUM LATINUM a free, online video course in the Latin language. I agree with evan1965 completely! The key to learning a lot of vocabulary for me has always been lots of reading and listening. Of course, when you start out, you will know very few words. So, you will probably have to look up lots of them in the dictionary. Having a good online dictionary or using a foreign language reading tool like BiblioBird, Lingro, Lingq or The Polyglot Project can help. In my experience, I rarely remember a word the first time I look it up. I usually have to encounter a word multiple times before I truly remember it. For this reason, using a computerized flashcard system like Anki or SuperMemo to review the words you are learning can help. I don't think flashcard systems are a complete replacement for learning words in context, but they can help keep the words fresh in your mind until you encounter them in context again later. Learning in this way, I was able to go from barely speaking Polish to speaking proficiently in only one year! Good job, although you have not mentioned about one little thing which seems to be quite relevant to me: it is very important to distinguish understanding of a word from using this word in a spoken language. For instance, when I speak in english in school it is sometimes a daunting challenge to find a proper word, even if I ,,know" (or rather understand) this word very well, in books for example. So, the questions is: how to transfer my vocabulary into speaking? I think that practice is the only solution. Practicing speaking can definitely help improve speaking! But for me, words transfer from passive vocabulary to active vocabulary when I know them really, really well. Once I know a word well enough, I'll probably throw it into a conversion. I can't really force myself to say a word before I've gotten to know it well enough. takie też znajduje tłumaczenia w słownikach. Masz rację, zmieniłem to w słowniku. Ale w ogóle, to znaczenie tego słowa jest bardzo rzadko używane. Osobiście nigdy w moim życiu nie słyszałem tego słowa tak używane, musiałem to potwierdzić w internecie. :-) Jest prawie wyłącznie używane w znaczeniu "kilka". d) when listening to audio and video recordings with diverse content. I believe the best way to learn English vocabulary is by topics with explanations of meaning, examples of usage in sentences and with subsequent exercises. It is possible to practise English vocabulary through exercises in listening comprehension, speaking, reading and writing. Thematic English reading materials can be combined with English phrase books, conversation books, thematic English dictionaries, English synonym dictionaries (that explain differences in synonym meaning and provide usage examples) and vocabulary practice books (with lexical exercises) for comprehensive, logical and intensive learning of English vocabulary. Multiple sense English words and synonyms (words with a similar meaning) present special difficulty for foreign learners. Other difficulties in learning and using English vocabulary include fixed word collocations, phrasal verbs, idioms, proverbs and regional differences in vocabulary usage. There are differences in English usage in English-speaking countries in terms of spelling, pronunciation, vocabulary and grammar. I know some specialised books dealing with British and American English differences. English usage can also be formal and informal. Formal English is the language of the mass media, education, business, economy, commerce, technology, science, etc. Informal English includes colloquial, slang and dialect usage. It is harder for foreign learners to master informal than formal English vocabulary. Thematic general English dictionaries combined with English synonym dictionaries are a valuable tool for mastering English vocabulary logically, comprehensively and intensively for real life needs of learners. Extensive reading on a variety of topics is another effective method for expanding English vocabulary knowledge by learners of English. I agree - the source of the vocabulary should be some concrete context (something you're reading or listening to), not a vocabulary list. IELTS online will provides everyone for their success with a step by step course structure.Because of online activities you can track your progress and study planner. 雅思考试网上教程 is been developed using the best practice of standards in online test preparation, so you won't miss out important tips and hints or knowledge that you need.